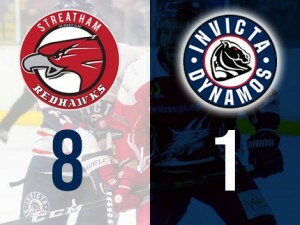 The ejection of goalie Conor Morris saw skater Harrison Lillis take to the net for the Invicta Dynamos on Saturday evening as they fell to an 8-1 loss at the home of Streatham IHC. Boosted by the return of Callum Best and Joe Allen, the Mos had 14 skaters on their roster with Conor Morris starting in the goal. The hosts also had 14 skaters available with Joshua Condren, Rupert Quiney and Jordan Gregory ruled out injured. Puck drop was followed by probably the worst start the Dynamos have made to a game this season and they conceded two quick goals – a brace coming from centre man Ryan Webb when he struck from close range within 20 seconds and again in similar fashion at 01:07. The second goal was on a powerplay after referee Richard Belfitt penalised Ondrej Zosiak for interference. Penalties would come thick and fast for the Mos who by the end of the 2nd period had 57 PIMS whereas Streatham only had 2. 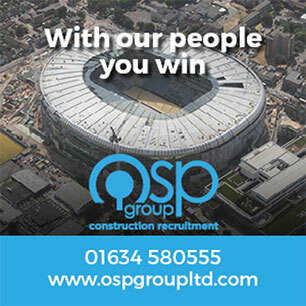 The Mos pulled one back for 2-1 on 05:57 through Oskars Ancitis who shot across King having been assisted by Ryan Morgan and Lewis English. Any hopes of drawing level soon faded on 09.53 though as the visitors conceded another when Adam Carr notched on powerplay for 3-1. The second period saw Streatham increase the lead to 5-1 courtesy of early goals from Leigh Jamieson (21:26) and Ryan Webb (25:42) putting the game beyond their opponents. The calls against the Dynamos then started coming thick and fast with Brandon Miles receiving a 2+10 check to the head penalty on 30:36 and Oskars Ancitis also sitting in the penalty box for 10 minutes through misconduct on 31:15. Thomas Beesley went on to score on the powerplay for 6-1 on 31:15 and Tom Soar added more pain on the Mos when he notched Streatham’s 7th goal on 35:41. The Soar goal was a sore talking point for the Dynamos with netminder Conor Morris slashing at Jacob Ranson and getting a game penalty. With no back-up netminder available to away side the second period ended early whilst defenceman come forward Harrison Lillis dressed to replace Morris in the Dynamos’ goal. Lillis faced two shots when the second period resumed with Leigh Jamieson firing the second shot beyond the stand-in netminder on the powerplay to make it 8-1 on 38:25. The final period saw no scoring from either side with very little to report although Lillis did pull out one spectacular diving save to deny Adam Wood on a one-to-one – the hosts resisting the urge to put the Mos to the sword given their now unfavourable position.